A legal attempt by the Rehoboth Town Council to prevent the Rehoboth Bastergemeente from assigning plots of land to members of their community has been postponed by the Windhoek High Court to the start of September. The postponement is due to specific gaps in sections of the case record from the court’s case file. The hearing of a High Court case in which the Rehoboth Town Council is trying to have the Rehoboth Bastergemeente and its leader, kaptein John NcNab, prohibited from allocating plots of land at the town to members of their community was yesterday postponed to the start of September. Oral arguments on the town council's application for an interdict against the Rehoboth Bastergemeente (Rehoboth Baster Community), McNab, and United People's Movement National Assembly member Jan van Wyk were scheduled to be heard by acting judge Collins Parker in the Windhoek High Court yesterday, but were postponed after it was discovered that sections of the case record were missing from the court's case file. With the hearing of arguments in the matter postponed to 1 September, an interim interdict that was granted against the Bastergemeente, McNab and Van Wyk in May 2014 was also extended until the deferred date of the hearing. In terms of the interim court order, the Bastergemeente – the historical, pre-independence government of the Rehoboth area – and McNab and Van Wyk are prohibited from allocating plots of land at Rehoboth to members of their community. In an affidavit filed at the High Court, the Rehoboth Town Council is claiming that the Rehoboth Bastergemeente surveyed and divided unoccupied land belonging to the town council during the first months of 2014, before they proceeded to allocate plots of land at the town to people. The town council is claiming that it alone has the lawful right to divide and allocate land that forms part of the Rehoboth townlands. The town council is also claiming that the laws that gave the Rehoboth Bastergemeente authority over the Rehoboth area and land in the area have been repealed – something confirmed by both the High Court and the Supreme Court in judgements delivered in 1993 and 1996 respectively – and that the Rehoboth Bastergemeente was trying to reassert its authority based on laws no longer in existence. McNab denied the allegations made by the town council in an answering affidavit that was filed at the court in February last year. He dismissed the allegations as not only “completely unfounded”, but also as based on hearsay and “undiluted speculation”. In his affidavit, McNab claims that the Baster people's 'Vaderlike Wette' (Parental Laws), dating from 1868, remain in force following Namibia's independence. In terms of those laws and the Baster people's traditions, male citizens of the Rehoboth community above the age of 18 and unmarried female citizens over the age of 40 are entitled to be allocated a free plot of land at Rehoboth, McNab states. 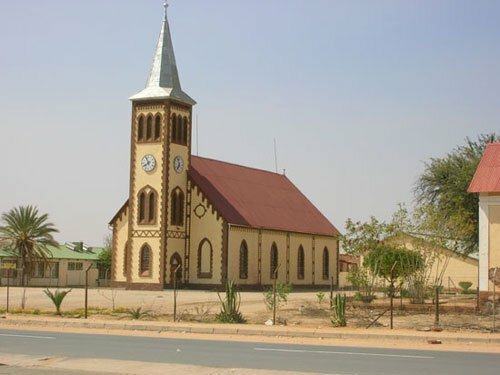 He also states in his affidavit that Namibia's government has recognised and endorsed Rehoboth residents' vested rights to obtain free erven at the town, as provided for in the Parental Laws. McNab says he and the Bastergemeente have done nothing more than trying to get the Rehoboth Town Council to give effect to an acknowledgement on the part of the government that free, unserviced erven had to be allocated to Rehoboth residents with documentary proof of having been allocated free land in terms of the Paternal Laws.